Upgrade your 1 inch filter today with a 2-inch Filters Fast MERV 13 air filter! The highest MERV Rating on the market is now available in this 2 inch air filter by Filters Fast. 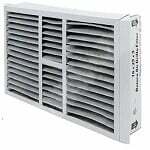 Save money on your heating and cooling bills and protect your HVAC equipment with MERV 13 furnace filters, AC filters. Residential Users Please Note: These 2 inch filters are designed for commercial use such as in offices, hospitals, schools, and other places where higher efficiency standards are required. Not all residential homes are equipped to accept a 2 inch filter, so if you are considering using this filter in your home please make sure to measure the space in your return grille before ordering. Commerical Users Please Note: The compact 2 inch design of this filter allows quick and easy installation with absolutely no modification to your existing equipment! Also known as the "Green Pleat" this filter can help you make your business or organization more environmentally friendly. The 2-inch Filters Fast MERV 13 air filter meets the Green Building Council's latest LEED (Leadership in Energy and Environmental Design) Indoor Air Quality Requirements for occupant health. That makes this filter a quick and efficient way to achieve points toward your company's LEED Certification. And in case you didn't know LEED certification can earn you tax breaks, which is just one way this filter can save you money! MERV, or Minimum Efficiency Reporting Value, indicates when a filter will be least efficient. So the higher the MERV rating, the more efficient the filter. It should be noted that most fiberlgass spun filters such as those found in your local grocery store are usually only a MERV 1 or MERV 2. This can affect the efficiency and air flow of your heating and cooling system, causing it to work harder to produce the same air flow and costing you more money! The Filters Fast MERV 13 Filter features a low pressure drop, which means less impact on your energy use, which again will save you money! The Filters Fast MERV 13 filter is a 2-inch filter constructed of a galvanized, corrosion resistant metal support grid and 100% electrostatically charged synthetic graded density media. The media used is resistant to a wide range of chemicals and will not absorb moisture, which can support microbial growth. The Filters Fast 2 inch MERV 13 filter's pleats are designed in a way to promote maximum surface area and dust holding capacity. The pleats are actually bonded to the frame to prevent any dust bypass. 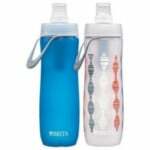 This means higher efficiency and air quality. 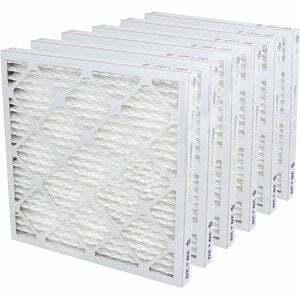 These filters have 18 pleats per lineal foot which creates a greater surface area to catch airborne particles than standard 1 inch filters. That also means that in most cases you don't have to change them as frequently! Filters Fast MERV 13 Air Filter effectively reduces pollen, dust, pet dander, mold spores, dust mites and other allergens from indoor air. Removing these airborne particles can help improve allergies and alleviate sinus irritation that can cause watery eyes, itchy throat, coughing, and sneezing. We now are offering a MERV 13 16x20x4 filter. It features twice the surface area of the 2 inch filter!